Just in—from Rachel and Devin of the Center for Urban Habitats: A design for the Demonstration Garden that will greet visitors to the Quarry Gardens. The plan view below shows the main entrance to the Visitor Center, with paths branching to east and west. While based on the same ecosystem modeling principles as plant galleries throughout the QGs, this garden has a different mission: To show property owners how local native plants can be employed to create beauty in more formal settings. Conditions on the sloped terrain range widely. The soil is mostly clay and rocks with areas of dry shade, dry sunny meadow, rock walls in both shade and sun, and a rain garden that alternates between wet and dry. Plants have been chosen to prosper in these conditions without improved soil. More than a hundred native species are being ordered for early spring planting. Visitors near the April opening may see this garden being installed and in its infancy. The process of actually installing the garden is substantially messier than indicated by Devin’s beautiful (highlighted) sketch, as you can see, below. At the time this picture was taken, there were 11 different tradesmen, mechanics, and workmen toiling on the site, some doing garden layout, some doing electrical installations, some working on the entrance pavilion roof, some doing general woods cleanup. 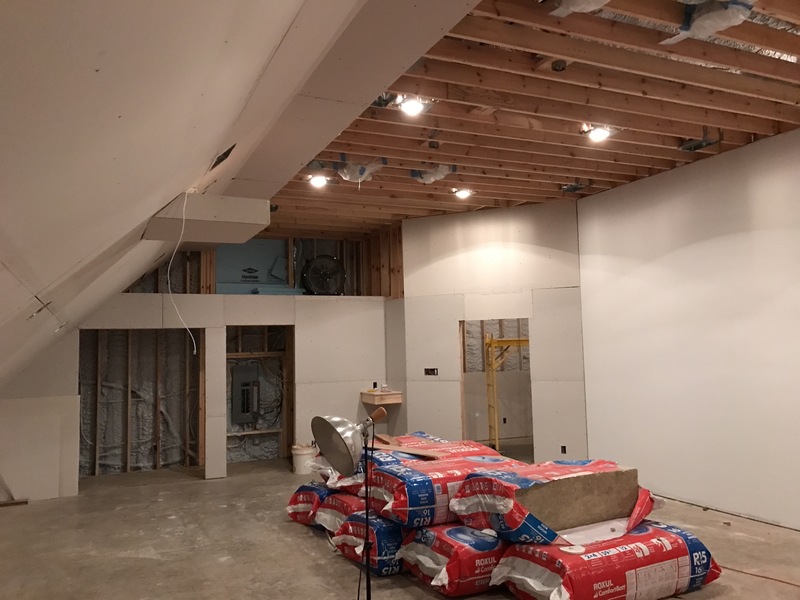 But the interior is progressing. Here’s a shot of the classroom that’s already behind times, as doors are in and bags of insulation have been distributed. In recent days, a contract has been let for an electric lift gate to control access at the entrance, the first of the train garden backdrops was installed (picture next time), and Bernice has designed a bunch of directional and explanatory signs. You also may notice that a revised website is under construction. All told, although it may be close, we may well be ready in time for our April opening. As we approach completion of the basic structures and plantings of the Quarry Gardens in anticipation of our opening in April, there may be more and more emphasis in our “Progress” blog related to happenings rather than developments. This is one of those, relating to a visit Monday morning, January 30, by volunteers Ezra and Theo Staengl, aged 13 and 10—new to CUH surveying—who walked two miles of Quarry Garden trails and identified 92 birds of 23 species. They gave us a list of what they saw on that one morning. The home-schooled brothers live in Nelson County and have been exploring habitats with Devin for years. Ezra propagated the Lobelia Cardinalis installed in the QGs fern gully wetland last summer from plants found in a seepage swamp on their parents’ property. So happy to have them on the team. Caption: Tiny and quick, the Golden-crowned Kinglet and Brown Creeper are hard to photograph—but Theo got them. The brown Creeper is the highlighted photo. 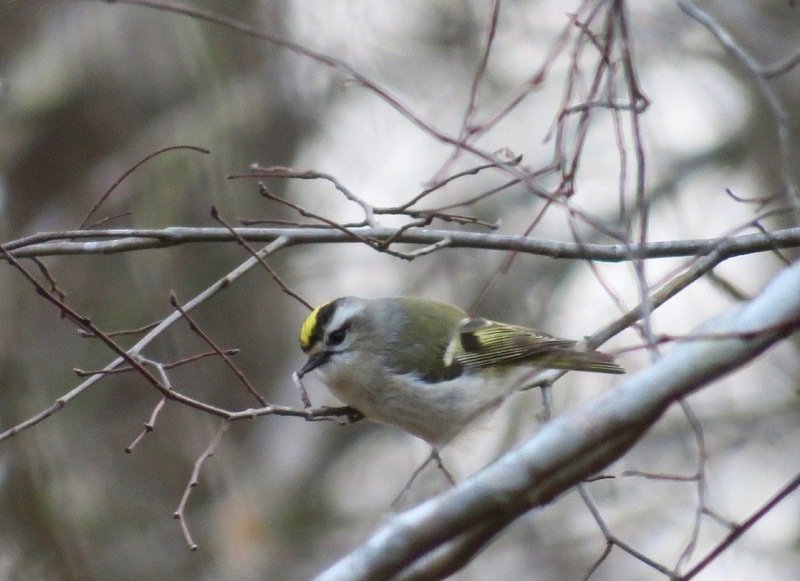 Here is the Golden-crowned Kinglet.